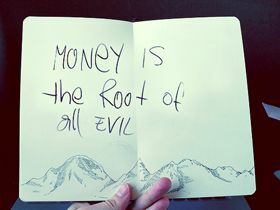 Money is a necessary evil that is no longer necessary. Even in a world with hate and evil, my heart will continue to grow. Will is a great force both for good and evil. It makes impossible things possible. Once acquired, it will enable us to have our way in all things. Sin seems to be threatening the world today probably because the evil ones are more daring in carrying out their mission than the good ones are doing. Evil is the quality of being wrong that is responsible for causing harmful effects. The evil actions of men live even after his death. Evil deeds do not prosper. “Evil draws men together” said Aristotle. Evil thoughts, ideas and actions have the tendency to creep into the deeper mind and become so infectious that it destroys those around. Since evil is the opposite of good, wise men sense the approach of evil and close all doors. Evil acts are enacted by men who seek pleasure in objectionable behavior. The irony is that those who indulge in evil acts are sure to get affected when it rebounds on them and does more harm than intended. Evil happenings certainly leave an indelible mark and therefore, it is best to erase all evil thoughts from the mind in the initial stage itself. The following quotes are given by famous people on evil and they are worth thinking over.